I am writing this on 15th October sitting in front of the TV, but this won't be up until maybe next Monday. Today was just any normal day. I had my Tesco online shop coming and that came, everything was normal. After I put my shopping away I made myself a cup of tea, put my feet up, went on facebook and then the UK Extreme Couponing and Freebies post came up. 'Argos glitch 2 toys for £30 offer going into basket at £15' was on there so I first ordered a gift for Mr P for Xmas (it's only a small and funny gift) and I got an Air Storm Huntress Z Curve Bow for Little Miss P. She's seen it somewhere but I don't have a clue where, I think it'll be for her birthday though so I will put it away. I then went back on to see if the offer was still up and it was, so I had a look and got two more things for Little Miss P's birthday. I will give them to my mum to buy off me. 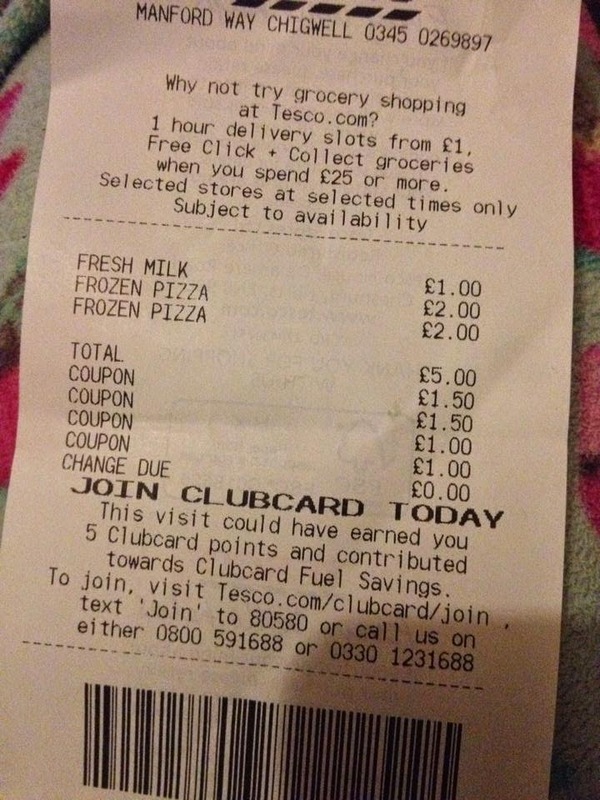 I also popped to my little Tesco to pick up my free pizzas. I picked up two of them and had a £1 over so I got some milk and I didn't have to pay anything!... I was like oh yeah, I did good, lol. I know it's only a small one but I am so proud of it and I will be keeping this receipt just because it was all free. It's ok, I know I am sad. That's it for today, see you all soon.